Everyone appreciates a good water container every time they go to school, office, trips, excursions, and gym. These custom water bottles or jugs are pretty sustainable because you don’t have to buy disposable water bottles just to quench your thirst. As a result, these custom water jugs provide eco-friendly options to help save the environment. Personalized water jugs are a great way to advertise your brand for all types of outdoor or indoor events. These are great for concerts, sporting events, and picnics. Also, these could be a great gift with purchase for kids to use in schools. In our photo, we see a water jug from Nestle which was marketing gift for an event. 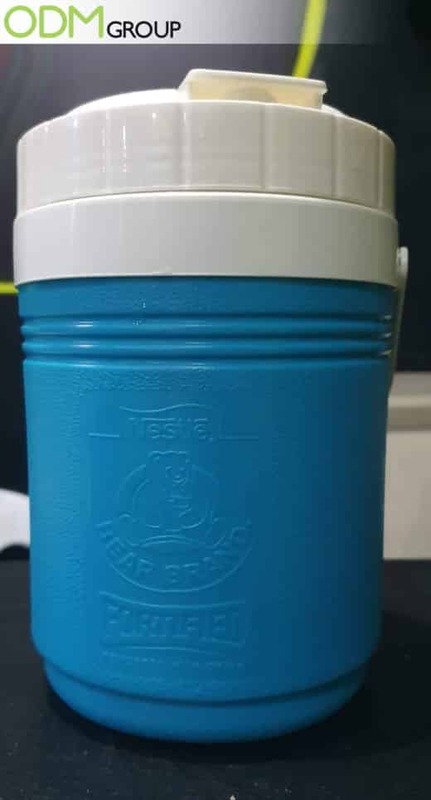 Certainly, giving away this kind of item is a good move for the brand because kids are using this as their dedicated water container in school. And since the Nestle logo is conspicuously etched on the jug, this container serves as a long term advertising tool for the brand. If you want to see a successful water bottle giveaway from a big brand, please see the link below. Why Should Your Brand Use Custom Water Jugs? Profitability and Brand Promotion – First of all, this complimentary gift with purchase is one of the best promotional ideas in the industry. It effortlessly promotes your brand whilst potentially increasing sales. These free custom water jugs give the customers the feeling that they are receiving more than what they are spending. Therefore, more customers buy the product because they see this as a good deal. Furthermore, customers feel the appreciation form the brand which builds customer loyalty and brand equity. Useful – Everyone loves to receive free promotional gifts from brands — that’s a fact! But customers appreciate it even more if they receive something that has a practical use. And that is why we find custom water jugs as perfect promotional giveaways because these are more than just a giveaway, it’s a lifestyle. Customisable – As you may have noticed, Nestle etched their logo on the surface of the water jug. This is a great marketing move because debossed designs are not easily erased. Therefore, for as long as the jug is in use, the logo will always be there. If you want to know more about debossed designs, check out the difference between embossing and debossing. If you would like to create your own version of custom water jugs, please feel free to contact our ODM team anytime. Our team is always on standby to answer all your marketing and manufacturing questions. We hope to hear from you soon! The 2 in 1 function of this water bottle is superb. Not only does it serve as a water container, but it also doubles as a phone holder. This is great for gym rats. Using water bottle as a gift with purchase makes the product more appealing because it’s practical and immensely handy.